Dedication towards Work: At one point of time, your boss was an employee himself or herself. He or she knows dedication towards work really pays well; it is, after all, the key to success. This is why, Cancerian bosses expect their employees to be as hard working as they were and still are. However, dedication does not mean staying back in the office after duty hours with zero productivity. Honesty: Those born under this zodiac sign are extremely honest people and prefer to be surrounded by the same. If you cannot be honest to yourself or your job for that matter, you cannot earn respect in the eyes of your Cancerian executive. Remember to give your honest opinions and not to falsely praise your boss; it does not impress a Cancerian. Achiever: It takes a true achiever’s spirit to reach to the top of the success ladder. If you have what it takes to get where you aspire to reach professionally, your Cancerian boss will recognize it instantly. However, do not lose that zeal. Self-Discipline: Though Cancerians themselves are fun loving eccentrics with a good sense of humour, it is hard to believe, they are just too serious when it comes to work. Do not let your Cancerian boss find you frolicking in the cafeteria during work hours, if you want the annual appraisal to go in your favour. Perfectionist: Mentioned once before, there is no harm in repeating it; Cancerians are perfectionists. They might take time to finish a task, but they would rather do it impeccably than inadequately. You might want to re-consider the report for deficiencies before your boss points them out to you. Leaders: If you do not want to lose your place in your boss’ good books, acquire some of his leadership qualities. Cancerians like to lead but not be led and they do it with great humility. This is what sets them apart from other zodiacs. Dependable: Basically, all a Cancerian needs is a little bit of sense of security. Once your dependability is evident to him or her, count yourself amongst the privileged people who made to the boss’ list of ‘The Dependable-s.’ However, don’t expect your boss to trust to instantly; think of all the qualities you need to attain first. He or she might sound like an absolute tyrant at work, nevertheless, a Cancerian boss has more layers than an onion and each layer is full of pleasant surprises for a deserving employee. 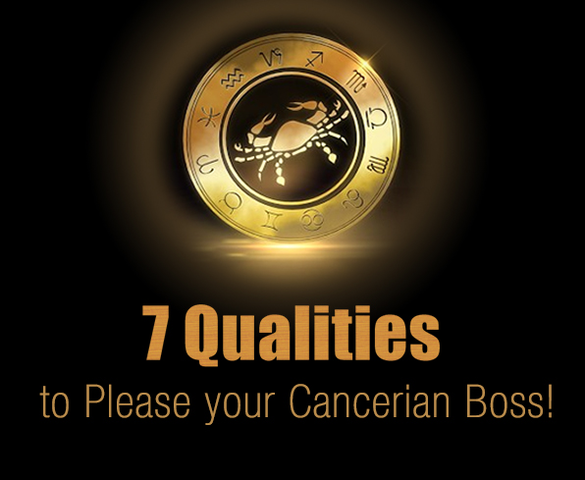 One of the best qualities of a Cancer boss is they are very calm and graceful unlike the normal other bosses who are either snapping, frustrated, rude or loud.